If you missed the last few weeks of Saving Money on Food Series, check out how to save money on meat and how to save money on dairy. It’s important to eat plenty of fruits and vegetables every day, but sometimes it can cost more to eat healthy. Here are some tips to stretch your food budget while keeping a nutritious diet without spending too much on fresh produce. Purchasing fresh fruits and vegetables in their off season costs more. Make sure to buy produce that’s in during the season. 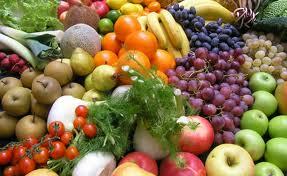 For instance, purchase apples and pears in the fall and strawberries and grapefruits in the spring. When there is a limited selection of produce in the winter, that’s when frozen and canned stockpiles come in handy. Check store sales fliers to see what produce is on sale that week, and incorporate those items into your dinner menu that week. Most grocery stores have some sort of discount produce rack that is filled daily with near-expired produce. If you know you’ll cook or eat it within a day or two, then pick up the discounted produce. Don’t pick it up just because it’s a good deal. Make sure to have a plan for it. Watch for fresh produce to go on sale that you can freeze, then purchase it in bulk. Also, watch for frozen vegetables to go on sale for less than $1, then purchase a bunch of them to keep in your freezer. Since purchasing frozen fruit is more expensive, purchase it when it’s on sale during the summer months and freeze it to use the rest of the year. This can be a lot of work, but you’ll save money by growing your own produce and canning it to eat year round. Plus, it tastes better than canned food from the store. Also, check out this post about tips to store and preserve fresh fruits and vegetables. What are other ways you save on produce?